This fan website went online on the 29th of March 2003. It was re-launched in its new edition on 29th of March 2010. 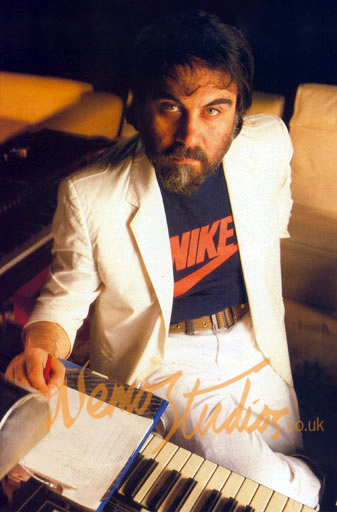 The website pays tribute to the sound laboratory Nemo Studios established in London by renowned composer Vangelis. This website acts as an online museum and it aims to provide a candid and informative insight into a poignant era at Vangelis’ pioneering sound laboratory. This website is driven by fan appreciation. The fan site has no affiliation or endorsement from Vangelis or his management. We have no means of contacting Vangelis’ management, and cannot deal with any enquiries regarding the afore mentioned. The website is purely driven by fan appreciation, and the content should be regarded as such. Therefore, we stress the views and opinions expressed on this site will not necessarily represent those of the composer, or his management. We apologise for any errors which may have occurred. The website is non-commercial and not for any form of financial gain. NemoStudios.co.uk is provided free for public access and there is no charge for visiting the website. All text on this site is original content and is copyright by NemoStudios.co.uk. Website’s idea, text, content creation, archives, design, coordination by Zyser. Special thanks and gratitude to Sweet Nemories for his invaluable input, additional archives, and for his photographs of Nemo Studios from 1983 to 1986. Thank you for dropping by at NemoStudios.co.uk, we hope you enjoyed your visit. Have a pleasant day. This labour of love is dedicated to VANGELIS. All photographs Copyright © their respective owners. Elsewhere comprehensive website with structured information on Vangelis. Movements detailed information on Vangelis’ releases. Vangelis Collector discography website dedicated to collecting vinyls, CDs, etc. Vangelis Lyrics lyrics from Vangelis' albums.